I realize this title might sound a bit provocative, like the outcome of a game of Truth or Dare gone terribly awry. But this month I participated in museum-sanctioned nakedness and submerged myself in a one-of-a-kind exhibit dubbed the Giant Psycho Tank — a sensory deprivation pool of heavily salinated, skin temperature water. 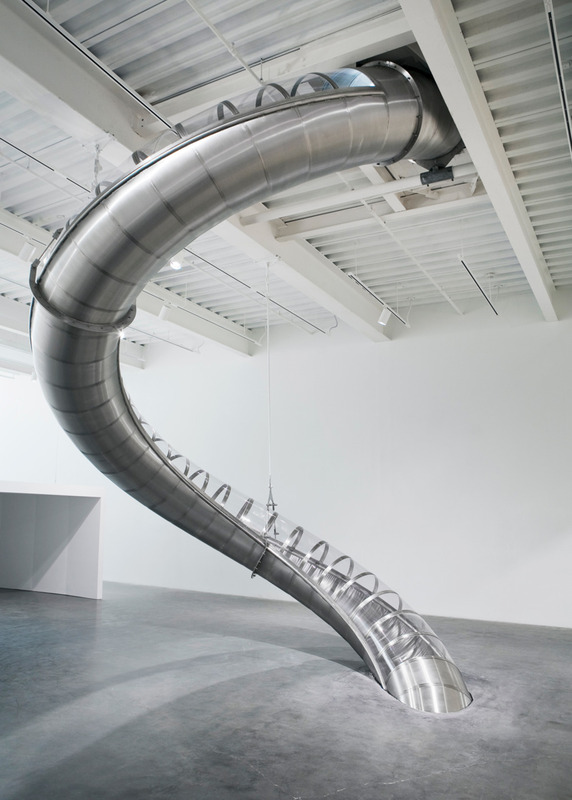 If you’ve spent any time in NYC in the past few weeks, it’s hard to miss the ads announcing this exhibit by artist Carsten Höller at the New Museum. Since its opening, visitors have been flocking to the Bowery to try out some of the experiential installations for themselves. See video at the bottom of the post to learn how the New Museum installed the slide! I didn’t intend to stand in line for the Psycho pool, but I had just gotten seriously banged up on another one of Höller’s pieces, a 100-foot metal tube slide which drops visitors down an Alice in Wonderland-like shoot at high speed into a room full of life-size neon crocodiles and hippos and rapidly flashing lights (not recommended for those who have visually induced seizures or a whole host of other conditions, the Museum warns). I nursed my throbbing hand as I stood in line for the tank, hoping the water would provide some form of relief. I had to suspend some judgement about the young unkempt looking man waiting patiently ahead of me and thanked my lucky stars that the NY Department of Health had ordered that the exhibit must now only accommodate one museum visitor at a time instead of the six-at-a-time naked strangers it was intended for. Once inside, I cautiously sat down on bent knees, thinking maybe I wouldn’t submerge myself. Eventually curiosity got the better of me, and I slid down into the water and floated effortlessly with my arms outstretched. I remembered a question someone once asked me as a child about what heaven might be like. I imagined a clean, light room with warm water, not unlike this. I felt calm and free, and I really didn’t want to get out. For every person who loves the tank, there’s someone who is utterly disappointed. When he came out of the tank, the man in front of me complained that the water was too cold and the tub was too shallow. I should have guessed that my kids, who had come along begrudgingly that morning, thought the slide took museum-going to a worthy and exciting new level. Vive la différence! As we walked home, caked up salt flaking off my body, I thought about some of the themes of the show: safety, doubt, childhood vs. adulthood, and what constitutes art itself. Maybe you don’t need to throw yourself into this kind of psychedelic experience to understand that our impressions of art are formed not only on the physical level (how naive of me to think of art as something primarily experienced through the eyes!) but also on the foundation of all the deep-seated experiences, impressions and beliefs from our past. And by bringing an amusement park-like quality to a museum, Höller calls into question our “regular” experiences in the outside world: couldn’t they be considered art too? This week, I’ll try going though everyday life experiencing movement, interaction, people and things as works of art. Just a little experiment to take things Beyond Siri’s Grasp! Hope you have a wonderful week. Experience is showing at the New Museum until January 15. More information here.